Located in San Pedro, the Port of Los Angeles (and the Port of Long Beach—located in Long Beach, as its name suggests) have been huge facilitators in international trade, helping put California on the economic map. However, there is much controversy tied to the port. While it has helped transform the economic landscape of Los Angeles (and Long Beach and San Pedro), it also has yielded tons of diesel emissions (however, as you’ll later find out, the POLA and POLB has taken action to combat against fuel emissions by launching the San Pedro Bay Ports Clean Air Action Plan). Read on to learn how it helped California increase its imports and exports, as well as why there is much to be proud of in San Pedro (and why you should consider San Pedro apartments). In 1542, when Columbus first founded America, Portuguese explorer, Juan Rodriguez Cabrillo, found the Port of Los Angeles. Surprisingly, the port in the 16th century, was shallow. The port stood the test of time; according to a KCET article, it saw the Mission Period, Mexican Independence, and the US-Mexican War. Centuries later, in the 1850s and 1860s, Phineas Banning, referred to as “Father of the Los Angeles Harbor,” helped the port get to where it is now. Not only did he found the city of Wilmington but created a transportation system of coaches. Eventually, since that time, the port flourished, making great economic headway for the bear state. Specifically, its expansion efforts were remarkable in the 1950s. From 1953 to 1954, 26.5 million tons were moved through POLA. During the 1960s, a five-year development project ($37 million) was created by POLA to add more berths and terminals. The port helped with trade. It was once the site of a big fish packing house, where, in 1929, three-quarters of canned fish in California came from Los Angeles. These canned (tons and tons of) fish were turned into fish meals, oils, and also resulted in other economic positives. While the port helped to generate a enormous amount of revenue for the city of San Pedro, Los Angles County, and the state of California, it also gained much community uproar. Sadly, the port was generating lots of diesel exhaust, which is toxic and poses several health risks. At one point, before the Port of Los Angeles took environment initiative, it was responsible for emitting as much as 16,000 trucks running 24-hours straight worth of diesel exhaust. The Port of Los Angeles and the Port of Long Beach responded to the public outcry. In 2006, it launched the San Pedro Bay Ports Clean Air Action Plan. This plan looks for ways to lower the pollution that comes from emission-producing sources—such as trucks, trains, ships, tugs, and workboats, in addition to cargo-handling equipment like tractors and cranes. The Port of Lost Angeles is one of the biggest players in the international trade market. The port is a key player in a global exchange, which accounted for $8.9 trillion. In 2005, it was named the fifth largest seaport in the world. And the Port of Los Angeles and Port of Long Beach, combined, as reported in 2014, helped with $14.1 million containers per year (its large dollar figure was another reason for the title). And, in 2017, the Southern Californian port is still going strong. The 7,500 acres is responsible for 86 ship-to-shore container cranes. It has created hundreds, if not thousands of jobs—throughout the years. And, as of 2017, it has a budget of $1.2 billion, which is $.2 billion up from last year (which was $1 billion), implying some promise of economic growth. The Port of Los Angeles is a significant focal point for the city of San Pedro. It has had a past filled with economic growth and environmental controversy, yet it has persevered and improved. With the budget escalating in the billions of dollars, it looks like the Port will continue to be a huge source of income for San Pedro and its inhabitants, as well as for Los Angeles County and California. If you are in the area, we recommend that you take a look at the port for yourself. 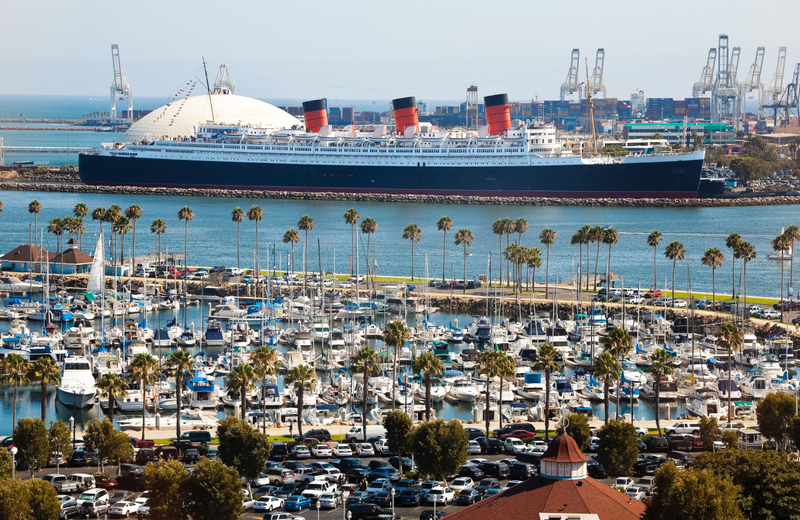 The Port of Los Angeles and Port of Long Beach helped put California on the economic map. It began in 1542, when Juan Rodriguez Cabrillo (Portuguese explorer) came across the port (which was shallow at the time). The port witness the changing times: Mission Period, Mexican Independence, and the US-Mexican War, to name a few. Eventually in the mid 1800s Phineas Banning helped spur its growth. A century later, the port was on its way to flourishing; it expanded tremendously in the 1950s, and a 5-year, multi-million-dollar development project was underway in the 1960s. In 2005, it launched the San Pedro Bay Ports Clean Air Act, which finds ways to lower emissions in pollution sources and cargo-handling equipment. In 2017, it is still on top, with a budget of $1.2 billion Looking for San Pedro Apartments? Consider The Vue. With floor plans ranging from one to three bedrooms, you are bound to find a living space that is right for you. The apartment facility offers amenities such as 24-hour concierge service, yoga and palates studio, business and conference room, resort style pool and cabanas, state of the art fitness center, sky lounge rooftop terrace, clubhouse and media lounge, among others. It also is a short distance from the eclectic and thriving city of Long Beach, as well as only 20 miles away from Downtown Los Angeles. Call us now for a free tour.